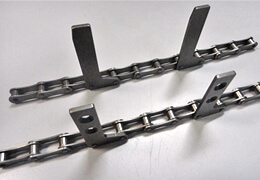 This category of products are standard products modified suitably for use in specific applications and hence the name – Adapted chains. Attachment chains form the major sub-category under these chains. We boast of developing a wide range of attachments which are used in critical conveying applications in the Electronics, Packaging and Food industries. We have built expertise in developing custom attachments which undergo special heat-treatment processes ensuring the highest level of performance.